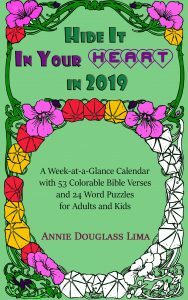 I wanted to create a calendar with pictures to color for every week that would also help me memorize Bible verses. And why stick with just the usual holidays? I decided it would be more fun to also include the ones that nobody's heard of – like International Sword Swallowers Day!